The Age of Adaline is a film directed by Lee Toland Krieger and starring Blake Lively (Adaline Bowman) and Michiel Huisman (Ellis Jones). Harrison Ford, Kathy Baker and Ellen Burstyn co-starred in this film. The film was co-produced by Lakeshore Entertainment and Sidney Kimmel Entertainment and it was released to cinemas in 2015. Think of this review, as revisiting a classic, only it is not old enough to yet be considered vintage. 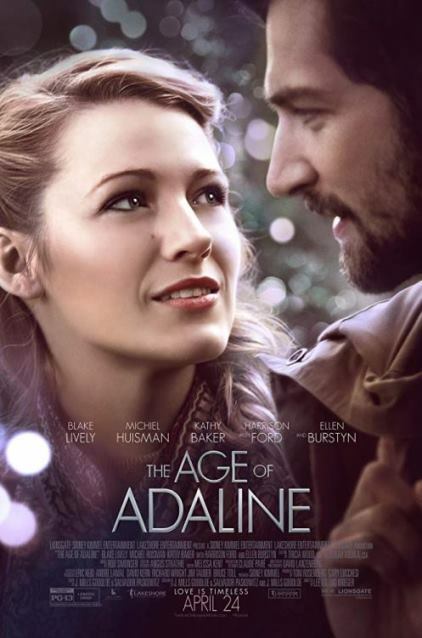 It would not be correct in referring to The Age of Adaline as a romantic movie, although it has that element to it. In some ways the film is a tragedy without a tragic ending and in other ways it is a drama with many moments of both joy and sadness. The Age of Adaline received mixed reviews and the box office take is best described as modest, even though during the first week it ranked as number three. J. Mills Goodloe and Salvador Paskowitz crafted an excellent screenplay that drew some criticism for being slow moving in the beginning, but that criticism came from people who obviously do not understand the necessity of building a strong backstory for a character, Adaline Bowman whose life spanned 107 years. Did we happen to mention that she stopped aging, when she was twenty-nine years old? We are not going to give away all of the secrets of this movie, but suffice to say that Adaline endures a life that simply does not allow her to live. The fact that she never ages would become suspicious and subject her to becoming a medical sideshow, so she stays in one spot for a year and then moves on. As the decades pass, so do the people she has known and her own daughter (Flemming played by Ellen Burstyn) becomes the senior citizen that Adaline will never be. Blake Lively puts in one of the most powerful acting performances by a man or a woman in any era of film and after his appearance one-half of the way through the movie Harrison Ford is her equal. The tone of voice, the eyes and the facial expressions of both actors become the dramatic tension and far and away are more powerful than any overt actions could be. This is a film about hearts breaking, but not being finally broken. William (Harrison Ford) unexpectedly has memories that to use the character’s words, “I didn’t even know I remembered,” conjured up once again. Adaline is forced to make more difficult decisions and her daughter Flemming is not getting any younger. Ellis (Michiel Huisman) is the romantic interest for Adaline and although he is good in his role, the script does not really lend itself to him being more than a bystander in most of the more dramatic scenes. The real questions posed by this film are, if you could live forever and stay the same age, while everyone you knew grew older and passed away, would you want to? What choices would you make to protect your daughter? What personal sacrifices would you make to keep your life a secret? We are not going to tell you why Adaline Bowman does not age and we are not going to even hint at the ending of this film. What we will tell you is this, if those possibilities existed, what this movie lays bare is you would be faced to make some very difficult choices. We said in the beginning that this is not a romantic movie, but it is one that has romance in it. For every person who lost a love, almost lost a love, had “near misses,” or had to make choices about love, this film also has something for you. Kathy Baker, as William’s (Ford) wife Kathy Jones and Ellen Burstyn, as Flemming put in the type of performances that we have come to expect from these two iconic actors. Baker and Ford are very convincing as husband and wife and Harrison Ford’s ability to become strong, vulnerable and perplexed all within a span of half of the film, once again remind us of how for so long we have been gifted by this talented actor. As for Blake Lively, as wonderful as the cast is around her, she owns this film. There is no mistaking that she is indeed the star and rightly so.